Will sand dams help the Muellers fight flooding? Home › LOCAL › Will sand dams help the Muellers fight flooding? THE MUELLERS STAND atop a sand dam con-structed on a dry wash on their rural Vernon County property in the Town of Liberty. POSTED October 10, 2018 3:03 p.m.
LIBERTY - Town of Liberty landowners Mike and Susan Mueller are no strangers to the impacts of flash flooding. On their rural property where the two operate a pastured pork farm, their steeply hilled land and driveway are regularly scoured and gouged from water rampaging down Old Highway 56. The situation causes ongoing road repair issues for township road crews, access problems for the Muellers and neighbors uphill, and the expense of repairs for all. Mike Mueller read about an innovative engineering technique for slowing and capturing runoff in intense rain events in an area that is otherwise a dry wash. Sand dams, mainly used in extremely dry climates, are small concrete or stone structures placed across a stream or dry wash to store water following a period of rainfall in the immediate area. The skill in designing these structures comes in siting them in such a way that their reservoir will passively fill with sand over a bottom of bedrock. What then seems like a clogged piece of infrastructure is a sophisticated sub-surface reservoir. 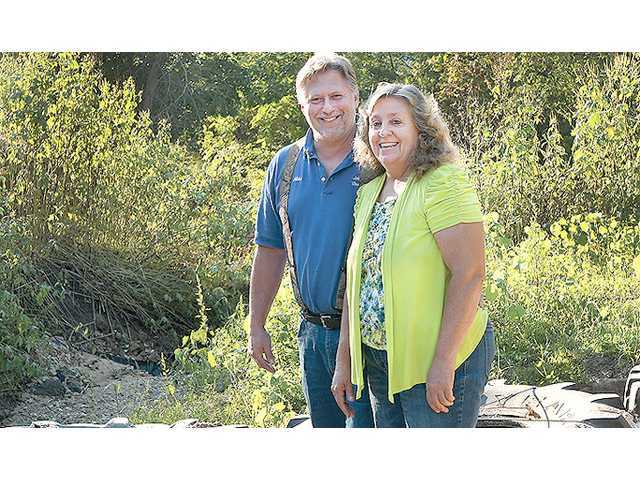 Mike and Susan believe the concept has an application in the dry washes on their land that channel water in extreme rain events. During a rain event, a portion of flashy, turbulent storm water traveling overland percolates into the accumulated mass of sand, the porosity of which allows for that water to occupy 40 percent of its total volume. Mike Mueller learned of the technique from the work of Stuart Hoenig, Adjunct Professor of Agricultural and Biosystems Engineering at the University of Arizona in Tucson. "Tires are highly engi-neered structures," Hoenig said. "Cutting tires up for scrap is like buying a house and tearing it down for firewood." Hoenig supervised construction of a sand dam made of individual automobile tires about 50 miles west of Tucson, in an area called the Brawley Wash. Hoenig’s tire dam was built in 1999, and in just three years resulted in a five-acre area of grass-covered silt upstream. In addition, the sand filled a gap in a ranch road that had to be bulldozed after every rain. The Muellers got started on this project in the aftermath of catastrophic flash flooding in September 2016. Having repaired and soldiered forward after the August 2008 flash flooding destroyed their driveway and blocked access off the town road, they were dismayed to once again find themselves in the clean up and repair mode. Susan described how she and Mike needed to think outside the box about how to work with their land and protect their pastures and animals. Mike spent the summers of 2017 and 2018 in construction of the first of seven planned sand dams on his property. Mueller built the dam by leveling an area in the dry wash to make a good platform. He then placed the tractor tires two deep across the span of the ravine, fastened the layers together with bolts and cables, and then backfilled the tires with gravel and dirt. In addition, he used smaller tires, bolted together, to create winged abutments in the sides of the ravine to anchor the structure to the hillside. These wings channel water to the center of the structure and prevent the hillside at each end from eroding away. In the August 27-28 rain event which caused historic flooding in the area, the Mueller’s Old Highway 56 property was once again inundated with flash flood waters, sand, rock and even boulders rumbling down the dry wash through their property and across the road. After the rain, the ravine area behind the sand dam was almost completely filled with sand and rocks. The Muellers contend that damages to the road were much less than in the 2016 flash floods. The members of the Town of Liberty Board present at the meeting seemed open to giving the Muellers a fair hearing. They also took great care to hear the input and concern of Orlin, the township’s road crew leader. Mueller observed that without wings on the side of the dam, water was spilling over and crossing the road. The next morning, he made a preliminary modification out in front of the next rain event, which came in that afternoon and dumped an additional four inches of water. “After the tweaks I made between the two large rains, installing the wings, the water no longer went over the road,” Mueller said. Orlin spoke to the board about the ongoing problem presented to the township by Old Highway 56. He disputed Mueller’s claim that the damage was less in 2018 than it had been in 2016. The Muellers presented the board with photographs contrasting the damages in 2016 versus 2018. The photos clearly showed catastrophic damage in the aftermath of the 2016 rain event, which rendered the road impassable. In 2018, the photos showed damage to the road, which made driving on it difficult and inadvisable, but did not seem to show it being completely impassable. Town Supervisor Adrian Amelse observed that most of the water had been channeled through the culvert intended for that purpose, but that some had spilled over the road without significant damage. Mueller responded that the more water that can be held and slowed down up valley, the less that would come down and cross the road. He pointed out that the sand and rock held behind the dams not only slowed the water down by spreading it out, but also served as an absorptive reservoir which would store water and reduce the total volume of water moving down the hill. Susan Mueller told the board that they plan to have the sand dam concept evaluated by a hydrologist and an ecologist. Mike Mueller pointed out to the board that part of the problem in moving the water coming down the hill and protecting the road lies in the configuration of the culverts. Susan Mueller, who works as the Readstown Town Clerk, pointed out that in doing research about flood damages and recovery she had run across a FEMA publication talking about a solution for a road that intersects with a dry wash subject to flash flooding. According to FEMA, low water crossings are suitable for low volume roads where the normal volume of water is relatively low. They can be useful for infrequently crossed waterways that experience flash floods, where it would not be economical to construct a bridge or culvert. The more stable the streambed and banks are with bedrock, and the lower the existing bank slopes and grades are, the more suitable the site is for a low water crossing. There are two types of low water crossings - vented and unvented. Unvented low water crossings or ‘fords’ are constructed of rip rap, ‘gabions’ (a galvanized wire box filled with stones/rip rap used to form an abutment or retaining wall), or concrete to provide a stream crossing without the use of pipes where streams are dry most of the year and crossing use is temporary. Vented ‘fords’ use pipes under the crossing to allow low flows to pass through without regularly passing over the crossing. The pipes or small culverts may be placed in aggregate, riprap, gabions or concrete.